Today, I'm giving Bill the day off. I'm doing this for a few reasons. First, I have this interview with Mike Deodato, Jr. and I thought this would be the best place to take over the spotlight. Second, Bill is recovering from recent computer problems and I thought having this week off might help alleviate some of his stress from playing catch up. And lastly, if at all humanly possible, Bill would never take a break from working, unless you make him! So I'm making him. Yeah, I know I'm lucky to have a writer like Bill, someone this dedicated to our readers. Just like working with that Isabella guy, this is one of the many reasons running World Famous Comics is so rewarding. Before we begin, please note that any view points, direction of content, unasked questions, grammatical errors, or attempts at humor that flop in today's interview is not that (or the fault) of Bill Baker! Swinging High with a Master of Comic Arts! 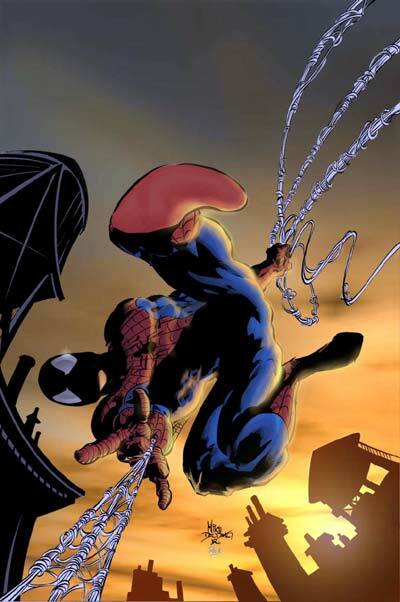 A talk with Spider-Man's Mike Deodato, Jr. Most comic book artists, if lucky enough to achieve superstar status on a popular book or by appearing in Wizard's "Top 10" lists, find that lightning hits once in their lives. Mike Deodato, Jr.'s had lightning strike twice, and he says he's just getting started! 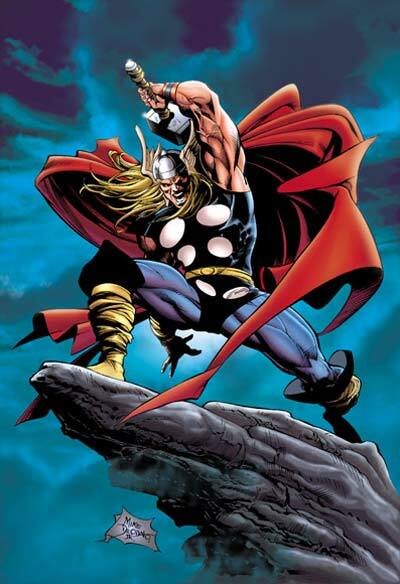 Born as Deodato Taumaturgo Borges Filho, this Brazilian-born illustrator got his start in Brazil's own comic book industry working with his father -- who is known in the U.S. as, of course, Mike Deodato, Sr. The father is credited with illustrating issues of Innovation's Quantum Leap and Lost in Space in the early '90s, though his son admits much of the work was actually his. "My father just didn't have the time," Deodato recalls, "and I was young and hungry." His father did, however, write and draw Brazilian comics, and the son had followed; much of this early work was reprinted in a seven-issue "Deodato Comics" series almost a decade ago by Caliber Press. 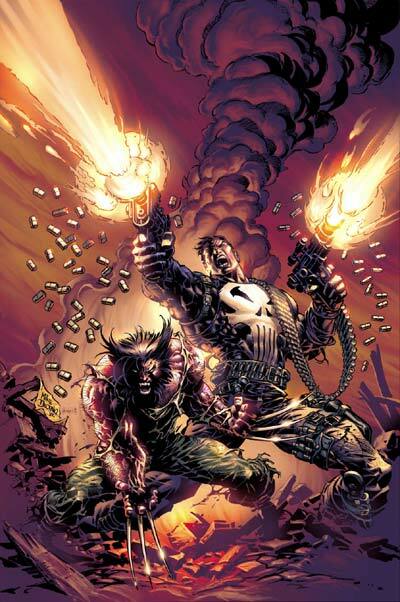 Mike Deodato, Jr.'s first U.S. work was actually inking The Protectors for Malibu Comics, though most people consider "real" first job to be Innovation's much-praised Beauty and the Beast series at Innovation, based on the Ron Perlman and Linda Hamilton TV series. "I went crazy on the book, learning as I went along, painting groups of six pages at a time in airbrush. I didn't get much sleep for a year, but I didn't care. I was doing what I loved!" 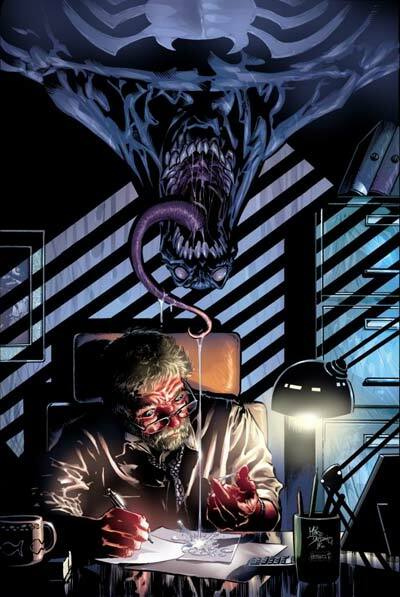 That work soon exploded into the above-mentioned Quantum Leap and Lost in Space books, but it certainly didn't end there; he was also painting Lost in Space covers and inking Sandu Florea's pencils on Mack Bolan: The Executioner, a comic book written by the creator of the decades-long series of novels, Don Pendleton. World Famous Comics: Going back 11 years, what was your life like then? WFC: So how did you end up going from that to superheroes? Deodato: It wasn't easy. My publisher at the time, David Campiti, was starting an agency, and he took me to New York to meet editors at DC, at Marvel, at Continuity. EVERYONE turned me down -- no exceptions! And my art style wasn't a whole lot different from what you're seeing right now on Hulk or Witches or Spider-Man! Tom DeFalco gave a speech about how Marvel only hires "name" artists. Carl Potts didn't see anything redeeming in my work. Comics legend Neal Adams said I'm "a great artist, but you'll never be a super-hero artist." I was feeling drained after hearing that -- wiped out. WFC: Clearly, you've now proved them wrong. Deodato: Basically, Dave took me to a couple of comic-book stores and showed me the biggest, best, most powerful stuff coming out at the time -- Jim Lee, Marc Silvestri, Neal Adams' most current stuff, and so on -- and so after I flew home and studied them, I created some new samples. WFC: Pencils and inks, or...? Deodato: Everything! Pencils, inks, sound effects, color, I even Greeked in the lettering. Not knowing those Image books were colored on computer, I airbrushed my originals in that style. I did two pages of samples for Innovation, and two pages showing Superman and Wonder Woman battling -- and she looked GOOD. Dave didn't get a thumbs-up at Innovation from his money people at my samples, and I didn't know it at the time, but that very day he resigned and jumped into agenting full-time. He got me work at Continuity -- Neal Adams said, "I take it back!" and gave me some jobs there. Deodato: Yep, while I was busy on those first few Continuity jobs, Dave was showing my new stuff at the other publishers, and Paul Kupperberg liked my Superman/Wonder woman sequence enough to try me on Wonder Woman #85; it was a thrill, but I wasn't happy with the inks. When they offered me the book for a year, I agreed to it as long as I could ink myself. WFC: Why didn't you stay on it? WFC: You did amazing amounts of work. So is that when you formed your Studio? Deodato: That came later. It lasted less than two years; I did it because editors at Extreme and Marvel asked me to, and it was the biggest mistake I ever made. Deodato: I signed to do six issues of Glory at Extreme, with the understanding I'd do as much as I could before I moved on to an exclusive contract at Marvel after Wonder Woman was over. They asked if I could set up a Studio of other people who could more or less work in my style to continue it. Marvel was sort of looking for the same thing on some of their titles...so I said OK, as long as the artists' names got listed. Extreme ignored that, slapped my name over everything -- including numerous books I'd never even heard of -- no matter who did them or what the style or quality was. Artists Ed Benes, Mozart Couto, Emir Ribeiro, and Rene Micheletti got the short end of the stick there. I remember a Glory cover -- it may have been #8 -- that Ed Benes signed his name to, and in the printed book my signature was pasted on overtop it. Deodato: I had to report back to Marvel every incident where it happened. It was sad. Marvel also put the Studio on books where they wanted my style and I was too busy or the budget couldn't afford me personally, because I was getting a real good rate. Marvel was more conscientious about the credit, but didn't always get it 100% right. The result was I was credited -- or blamed -- for a ton of work I had nothing to do with, and it haunts me to this day. Only a few weeks ago someone asked me how much of Hulk or Spider-Man is done by my Studio. None! Nothing! It doesn't exist! My Studio is just me working in my little air-conditioned office in my home! WFC: So you did Avengers for awhile, then Thor, then Hulk, then Elektra? WFC: After that, though, you seemed to disappear for awhile. Deodato: Really? Ummm...I was working steadily. I did a couple of Batman stories for DC, then did Lady Death and Purgatori stuff for Chaos for quite awhile. And I did my own thing -- Jade Warriors for Image, before it moved over to another company that forgot to pay us, so there's two issues sitting on my shelf. But ultimately, I was feeling burned out. WFC: So a break, perhaps? Deodato: I took a month off. Dave flew down to spend a week with my wife and me, and we hung out at the beach -- it's a block from my house but I only go when I have guests. It was great to get away from the board, talk, and think about what I was doing. We spent a lot of time talking about the evolution of my art, how it reached a peak on early Wonder Woman, then got kind of repetitive and exaggerated the faster I worked. I wasn't satisfied, and perhaps the editors weren't as happy as they could have been. So we talked it out and stumbled upon the idea of rejuvenating my style. I was going back to the "old style" everyone turned down years earlier, with lots of photo reference -- BUT I would take all the energy and power and excitement of the superhero layouts and do those first, without the reference. Then I would reference everything to match the layouts, and would shoot literally tens of thousands of photos with my new digital camera. And that's what I did. WFC: Did you go back to Marvel and DC with that? Deodato: Not right away. I wanted to work my way into it over time. So Dave offered me to Dark Horse for Xena: Warrior Princess so I'd get back to using references. And the editor said, "Can Deodato do likenesses? He's a superhero artist!" [* Laughter *] -- A total reversal of what came seven years earlier. But he got one look at my Lost in Space, Quantum Leap, and Beauty and the Beast work, then I was off and running on Xena for awhile. WFC: Didn't you do some World Wrestling Federation comics? Deodato: That was one issue -- Chyna II, for Chaos. I'd decided to experiment with shooting my art from tight pencils. That was the first one to do that. I liked the results and thought I was ready, so I asked Dave to get me back in at Marvel or DC. I signed a contract to do a Batman graphic novel, but they changed their minds and told me to pretend like I didn't sign it. They made me sign a quit-claim to the contract. So Dave offered me to Marvel. Deodato: Not really. A lot of people had gone out the door. 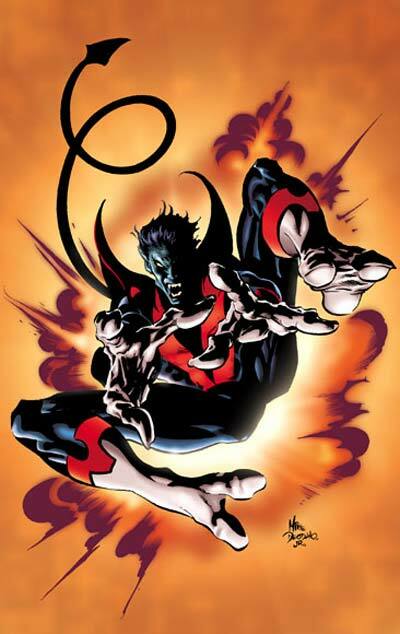 An X-Men editor hired me to do a 12-page Nightcrawler story, saying, "I want Deodato's best work! Really tight, powerful pencils, the best he's ever done, and I want HIM to do it, not his Studio." Even at Marvel, one of the places where they asked me to do that Studio for awhile, it still haunted me years afterward. Dave said, "Deodato doesn't have a Studio," and the editor replied, "I don't care, I don't want his Studio doing this." WFC: Err..."Don't let the facts cloud my argument"...? Deodato: [* Laughs *] Something like that! So, I turned in six really strong, tight pages -- the best I could possibly do. No response. We called, we Emailed...no response. I did the other six...turned them in, no response. Three weeks later, the editor calls Dave to tell him how unhappy he is with the pages -- they were too tightly pencilled, no inker wanted to touch them! WFC: So you did what he told you to do, and he gave you no feedback in progress, now he was unhappy you did what he asked you to do? Deodato: Exactly. So I offered to REDRAW the pages more loosely. The editor wouldn't even return the originals so I could lightbox 'em. Fortunately, I kept a photocopy. I quickly redid them, leaving all the blacks open, and the editor said, "Now that's more like it!" A week later, the editor was fired -- and his replacement editor called up, asking WHY I drew it twice, cuz the tightly-pencilled version was so incredible, so terrific, she loved it and wanted to print it from the pencils! WFC: [* Laughs *] Oh, man! Deodato: She was good to her word, and she even made sure I got paid for doing it twice, bless her golden heart. WFC: Bless her heart, indeed! So you did Tigra next? Deodato: No, I spent half a year on Witches, doing character designs, a short preview story for a Witches MegaZine, and two full issues plus covers and promo art. Then it got put on hold, because they decided to revamp it. That's when I did Tigra, which -- like Witches -- was printed from the pencils. Then I went back to Witches and did an issue's worth of Witches pages -- most of it interspersed as new or extended scenes onto what I already drew. Then it got put on hold again. I started drawing Hulk with Bruce Jones writing, and I was in heaven! Bruce and I just clicked -- it was the best comic book writing I'd ever had, and I'm happy to work with Bruce forever! WFC: Sounds like the inevitable Witches trade paperback will have a lot of unpublished stuff. Deodato: Yeah. The remaining two issues of the Witches story, by the way, are pencilled and inked by my good buddy Will Conrad, who had the not-enviable job of trying to match my style. It's good work, and in issue #4 he really shines. Witches was a nice book -- it deserves a trade paperback. Deodato: Tigra is one of those books where I wish they're printing it in black-and-white. Hey, there's an idea -- Marvel should collect all the new work I've done in this new high-contrast style and release an ESSENTIAL DEODATO all in black-and-white. I'd like that. WFC: There was a rumor you were going to be part of DC's freshening up of Superman -- along with Jim Lee and a few others. Deodato: Marvel and DC both offered me exclusive contracts at the same time! Working on Superman was a dream of mine. BUT...Marvel had Bruce Jones. The money was identical. I signed with Marvel because of Bruce Jones...and a little bit because of what happened on the Batman graphic novel, where after contracts were signed, they changed their minds. I didn't want to be left out in the cold again if it happened again. WFC: But you're not working with Bruce Jones now, are you? Deodato: True, but Bruce and I are planning on it happening again. Meantime, I'm back aboard Amazing Spider-Man, it's the flagship Spidey title and I'm working with J. Michael Straczynski who created Babylon 5, so how cool is that?? He is writing really excellent stories that have me jazzed about Spider-Man for the first time since the Stan Lee days. It actually feels fresh and alive, so I'm working hard to make sure the art is a as good as the story. WFC: So is Gwen Stacy really back? Deodato: Who? [* Laughs *] Next question! WFC: I notice your inker is Joe Pimentel. You're no longer printing from your pencils...? Deodato: After Witches and Tigra, only the first Hulk story arc was shot from pencils. As my skills matured, it made more sense to shift around my techniques so I could pencil more loosely, then detail it in ink, and it made the results even better. Then the schedule on Spider-Man was so tight --they wanted me first issue to be on sale before the Spider-Man 2 movie -- that Marvel insisted that I find an inker, so naturally I chose Joe Pimentel, the best inker in Brazil, to ink Spider-Man. For that matter, if Hermes Hadeu were alive, he'd be coloring Spider-Man. He was the finest colorist I ever had. WFC: You had quite a convention schedule lined up for this year -- Pittsburgh ComiCon, Motor City Comic Con, Wizard World Philadelphia, and Wizard World Chicago, but you suddenly cancelled all of them. What happened? Deodato: Spider-Man's fault! I got caught in his web! [* Laughs *] It was the super-villain called Deadline that interfered! That and my plans to move to the U.S. Y'see, last year I'd planned to move to the U.S., where it would be easy to do all these Cons; then that got delayed...I expect to be moving to America maybe around Christmas 2004. But the spider-schedule was so tight, I couldn't afford to lose all the Convention time and travel time those appearances would entail. So, unless things change, I am doing only ONE Convention appearance this year -- in Canada, in late August. My life should be settled down by then, and I plan to be attending with Will Conrad and Jinky Coronado and other friends. Meantime, if anyone wants to own my original art, they can drop an Email to my agent david@glasshousegraphics.com. WFC: So...what's next for you? Deodato: More Spider-Man! I'm gonna be on it for a year or two at least, and I can't wait to be part of the story unfolding. I'm also working on Dream Police, which is another J. Michael Straczynski story, in bits and pieces as I have time. I still want to see Spider-Man 2, since it's not opened yet here in Joao Pessoa, Brazil! WFC: It's quite a Summer for you -- lightning has struck again, and you're back on top. Spider-Man has everybody talking, you're getting great reviews everywhere, Witches is out, you're on covers of other titles, plus Marvel has announced a Marvel Visionaries book of your Thor run, and that upcoming Witches trade...you're all over the place! Deodato: Well, my books are, anyway. Me, I just have to stay home and draw!